The global non-invasive fat reduction market is consolidated owing to a few players holding a substantial share in it. Prominent names in the market have established a stronghold by expanding their geographical outreach by offering multiple non-invasive fat reduction devices. Keen players are also seen growing their marketing spends in order to build solid brand awareness and subsequently attract more customers. Besides, emerging players in the market are seen contributing majorly to its growth. Serving to drive demand in the global non-invasive fat reduction market is the alarming rise in obesity and health hazards posed by them. This has resulted in people increasingly going for fat reduction and body contouring both through non-invasive and surgical procedures. Demand for better products which are easier to use and yield faster results has resulted in manufacturers focusing on research and development of innovative products. This is also having a positive influence on the market. A report by Transparency Market Research predicts the global non-invasive fat reduction market to rise at a CAGR of 15.9% CAGR from 2017 to 2025 to become worth US$2.50 bn by 2025 from US$693.2 mn in 2016. The different types of non-invasive fat reduction technologies in the market are ultrasound, cryolipolysis, radiofrequencies, low level lasers, etc. Among them, the segment of cryolipolysis led the market with maximum share in 2016 on account of their widespread uptake by doctors, aesthetic surgeons, dermatologists, patients, etc. Cryolipolysis devices are mostly preferred by them over other devices owing to their exhaustive usage pattern. These non-invasive fat reduction energy based devices often use a combination of energy types in order to provide the most effective therapy. Besides fat reduction, cryolipolysis devices are also commonly used for skin and hair treatments such as removal of pigmented lesions, tattoo removal, skin rejuvenation, etc. As patients increasingly demand noninvasive treatment options, aesthetic providers are increasingly seeing the addition of these products as an essential addition to their suite of offerings. 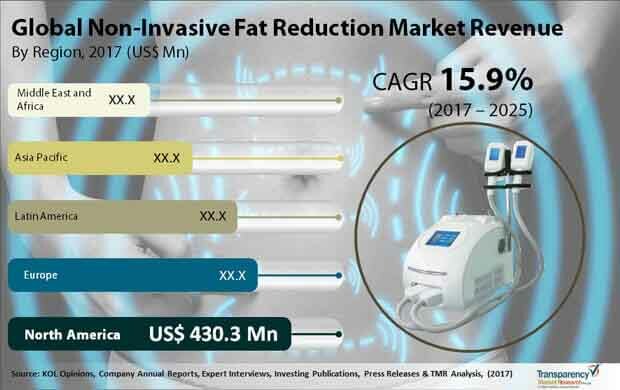 Depending upon end-users, the key segments of the global non-invasive fat reduction market are hospitals, dermatology clinics, and cosmetic centers. Of them, hospitals hold maximum share in the market since they provide easy access to competent physicians who are adept at conducting a wide array of medical aesthetic fat reduction treatments. Geographically, North America dominates the global non-invasive fat reduction market because of the unveiling of new products every now and then by well-established and upcoming manufacturers domiciled in the region. In addition, the higher spending capacity of people is also proving beneficial to the market in the region. By clocking a CAGR of 15.4% between 2017 and 2025, the market in North America is expected to pull in revenues to the tune of US$1.357 bn by 2025 and retain its dominant share as well. Europe trails North America in terms of market size. By rising at 16.9% over the forecast period, the region is expected to continue being in the second position in the years ahead too. Vis-à-vis growth rate, Asia Pacific is expected to outshine all other regions by registering a robust CAGR of 18.1% from 2017 to 2025 on the back of increasing disposable incomes and better availability of aesthetic procedures. Some of the key players in the global non-invasive fat reduction market are Fosun Pharmaceutical Co., Ltd., Cutera, Inc., Cynosure, Inc., ZELTIQ Aesthetics, Inc., and Syneron Medical Ltd. This report on non-invasive fat reduction studies the current as well as future prospects of the market globally. The stakeholders of this report include companies and intermediaries engaged in the manufacture and commercialization of various non-invasive fat Reduction devices as well as new entrants planning to enter this market. This report comprises an elaborate executive summary along with a market snapshot providing overall information of various considered within the scope of the study. This section also provides the overall information and data analysis of the global non-invasive fat Reduction market with respect to the leading market segments based on major technology, end-users, and geographies. The global non-invasive fat reduction market has been studied based on major non-invasive technology based devices, their end-users, and regional as well as national markets. Global non-invasive fat reduction market is segmented on the basis of type of technology: cryolipolysis, ultrasound, low level lasers, radiofrequency, and others. Based on end-user, the global market has been categorized into three key segments: hospitals, dermatology clinics and cosmetic centers. The market for these segments has been extensively analyzed based on their utility, effectiveness, sales, and geographic presence. Market revenue in terms of US$ Mn for the period from 2015 to 2025 along with the compound annual growth rate (CAGR %) from 2017 to 2025 are provided for all segments, considering 2016 as the base year. The market overview section of the report explores the market dynamics such as drivers, restraints, and opportunities that currently have a strong impact on the global non-invasive fat reduction market and could influence the market in the near future. Market attractiveness analysis has been provided in all the sections of the report in order to explain the intensity of competition in the market across different products/end-users/geographies. The competitive scenario among different market players is evaluated through market share analysis in the competition landscape section of the report. The section also includes completion matrix that analyzes the competition among some of the top global players operating in the market. All these factors would help market players to take strategic decisions in order to strengthen their positions and expand their shares in the global market. Geographically, the non-invasive fat reduction market has been segmented into five regions: North America, Europe, Asia Pacific, Latin America, and Middle East & Africa (MEA). Each regional market for non-invasive fat reduction has been further categorized into major technologies, and end-user segments considered within the scope of the study. Key country (U.S., Japan, Germany, France, U.K., Australia, Canada, China, Brazil, Mexico, India, etc.) market revenues have also been provided in different regional sections within the report. Market revenue in terms of US$ Mn for the period from 2015 to 2025 along with CAGR % from 2017 to 2025 are provided for all the regions and nations considering 2016 as the base year. The report also profiles key players operating in the non-invasive fat reduction market based on various attributes such as company details, SWOT analysis, strategic overview, financials, and business overview. Major players profiled in this report include Alma Lasers (Fosun Pharmaceutical Co., Ltd.), Cutera, Inc., Cynosure, Inc., Solta Medical, Inc., Syneron Medical Ltd. and ZELTIQ Aesthetics, Inc.